1. Combine flour, oatmeal, brown sugar, butter and salt in a bowl. 2. Mix thoroughly until all dry ingredients are well combined. 2. 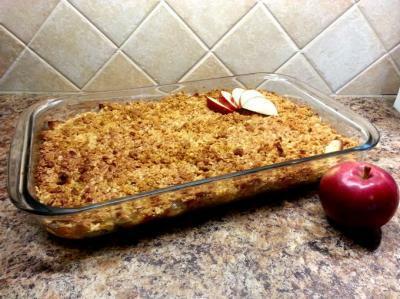 Place apple slices in a large glass baking dish. 3. Drizzle with apple syrup. 4. Cover with crisp mixture. Bake uncovered in a 190°C (375°F) for 35 minutes.